What To Say When Someone Asks "Can I Borrow Your Miata?" What To Say When Someone Asks "Can I Borrow Your Miata?" Now, to me, this is the absolute peak of Very. Serious. Questions. Yes, it’s because I am a gearhead, and even more so, it is because I am a Miata owner. Asking to borrow someone’s car is like asking to borrow their surfboard or their guitar or their spouse. It is a bad idea, nine times out of ten, and that tenth time better involve your house being on fire, the Mafia ransoming your cat, and Jason Momoa running off with your wife all in the same afternoon. If you ask to borrow my car, specifically my Miata, my response would involve a swift and righteous swing of that jeroboam of champagne up-side your fool head for even thinking about . . . just a second . . . got to cool down . . . go to my happy place . . . calm blue ocean, calm blue ocean, calm blue ocean . . . ah, there, that’s better. What was I saying? Yes. Car companies with a sense of humor. 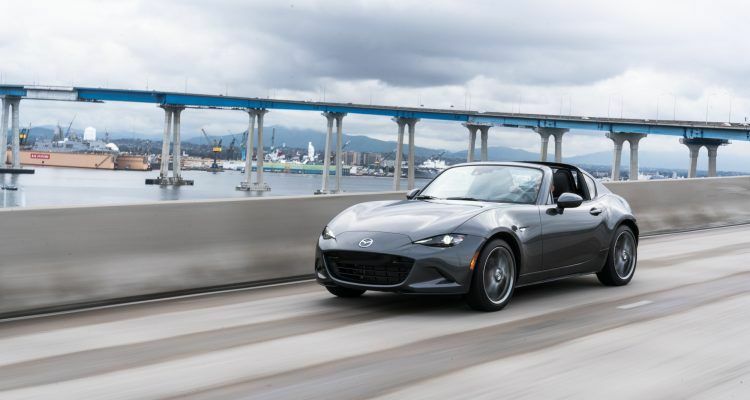 “When the original MX-5 Miata made its world debut on a frigid morning at the 1989 Chicago Auto Show, few could have imagined its importance – and staying power – for the automotive industry,” reads a description on the car from Mazda. Photo: Mazda North American Operations. Mazda, the Hiroshima-based automotive concern that pretty much singlehandedly saved the lightweight sports car from oblivion in 1990, is the subject of a new, rather hysterical decision tree graphic to help you figure out if you should ever lend your Miata to someone. The whole thing was cooked up by RealMazdaParts.com, one of the largest online retailers of OEM Mazda replacement parts and accessories, and it’s hilariously tongue-in-cheek. The flow chart exists to help “Miata owners make an educated decision about whether or not to loan their car to a friend.” They correctly label the whole procedure as being “stress-inducing” and they got that right. But an educated decision? How educated do you have to be? Photo: Mazda North American Operations. 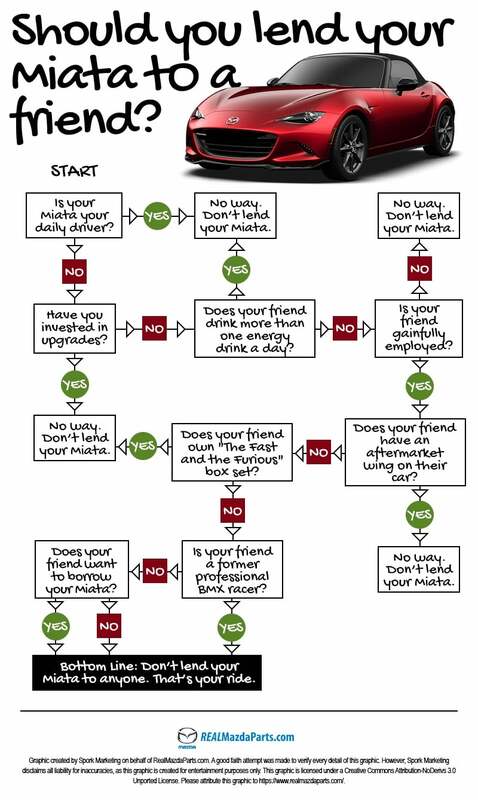 Please note this decision tree from RealMazdaParts.com only applies to Miatas. If you own a pickup, wagon, or van you are already (or will soon be) very used to handing the keys over to “friends” you didn’t even know you had. Tony Borroz has spent his entire life racing antique and sports cars. He means well, even if he has a bias toward lighter, agile cars rather than big engine muscle cars or family sedans. 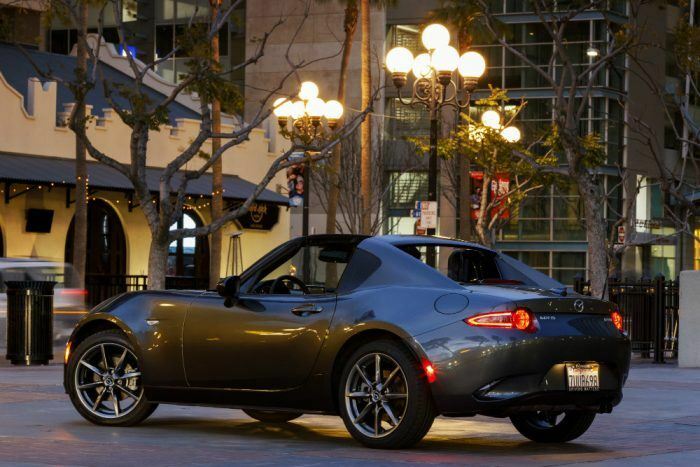 No Comments on "What To Say When Someone Asks “Can I Borrow Your Miata?”"